Celebrating Liliu’s 75th birthday, 1913. There Were Many Who Went to Congratulate Her This Tuesday. This Tuesday past, Queen Liliuokalani was seventy-five years old, and her friends, companions, locals and foreigners visited her at her home at Washington Place to see her, and to give their congratulations to the Queen of Hawaii nei for reaching that old age. Just like in past years, there was a rush of the citizens of town to see Queen Liliu; it was so in the morning of this Tuesday, and the Queen welcomed warmly all who shook hands with her; it is estimated that their number reached a thousand. The hours set aside for the public to visit her was from eleven o’clock to twelve o’clock, but there was celebration on the previous Monday night by singing groups with their instruments, as they serenaded the window of the home of the person for whose birthday it was, until the hours when the sun appeared. After eight o’clock in the morning of that Tuesday, there was also a luau given to celebrate the day, and the royal attendants and a few malihini were invited, and they sat at the table laden with so many good things. When the time came for the opening of the audience with the public at eleven o’clock of that morning, everyone showed up at Washington Place [Wakinekona Hale], and there too was the Royal Hawaiian Band [Bana Hawaii] honoring the one whose birthday it was. Present was the Honorable Edward K. Lilikalani, where he stood ready to greet the public, and Colonel Iaukea and John Dominis introduced them before Queen Liliu, as the Queen would always give a smile to each and everyone who shook hands with her. There also was Princess Kawananakoa to assist the Queen, wearing her finery, while the interior of the reception room was decorated with flowers, and feather capes [ahuula], kahili, and everything hearkening back to the past era, the time when this archipelago was governed by Monarchs. At this audience, there were many Hawaiians who showed their affection for their queen, by kneeling before her and kissing her hand as they were used to doing. After the audience, the Queen and her attendants got aboard automobiles headed for her seaside home in Waikiki, where a party was prepared and waited for her and the malihini invited to meet with her and to enjoy with her that day. The Royal Hawaiian Band [Bana Hawaii] was also there following her to Waikiki, to continue to give honor to the table of the queen. There were several hundreds of invited people that arrived to that party, from kamaaina to malihini, and they all ate until satiated of what was prepared, and they drank to the health and happiness of the mother, with happy thoughts and with hope that the life of Queen Liliu would be extended and that she would have more years to live. More on Liliu’s 73rd birthday celebration, 1911. The Queen’s health is fine indeed, and in the morning, the Band of the County [? Royal Hawaiian Band] arrived to play while she dined on breakfast until 10 a. m. Several associations arrived to giver their congratulations to the Alii; and at 11 o’clock, the procession of haole friends to see the Alii began, and this perhaps is the grandest royal audiences of haole giving their congratulations to the Queen. The Queen wore a white lehua [lehua puakea] lei from Hilo, and on her Royal countenance was happiness. On that morning of her birthday, she presented the water leaping land of Waikahalulu as a Park for the public, and it will be administered for the benefit of the people. The Hoku o Hawaii prays for the long life of the beloved Queen of Hawaii, and although she has no throne upon to rule, hers is the throne of aloha within the hearts of her loving people. May the Queen live in God. Ka Hoku o Hawaii, Buke 6, Helu 18, Aoao 2. Sept. 7, 1911. And yet another on Liliu and the Red Cross, 1917. Governor Pinkham presenting Red Cross flag this morning. Col. Iaukea, the queen’s secretary, is seen holding the flag. FOR the first time in history a Red Cross flag was raised today over the territorial capitol, former palace of Hawaii. The flag is the gift of Queen Liliuokalani, and it was at her request that it was first displayed from the staff on the executive building. In an impressive ceremony held at 10 o’clock this morning Governor Pinkham presented the flag on behalf of the Queen to the Allied War Relief Auxiliary and the Red Cross workers of Hawaii. Mrs. Henry F. Damon, president of the auxiliary, received the flag and hoisted it to the breezes. The ceremony was held on the mauka steps of the capitol, fully 50 women and a number of men gathering for it. A generous clapping of hands greeted the banner as it opened against a clear background of blue sky and in the bright gleam of a morning sun. 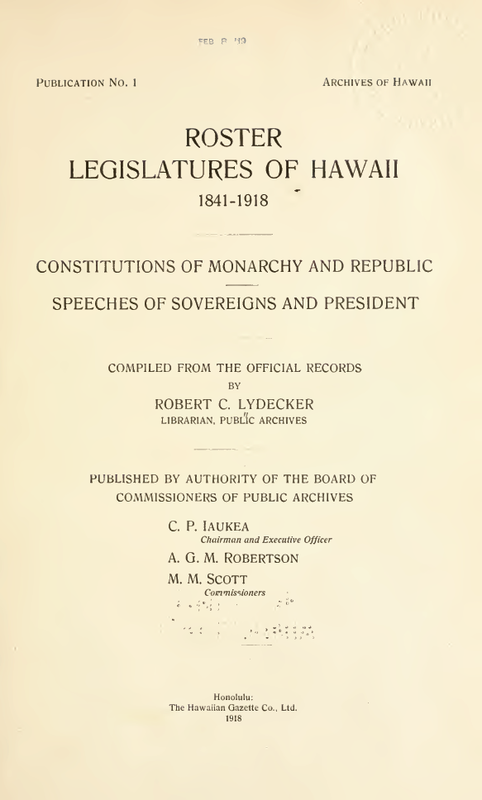 “You are gathered here to receive from Her Majesty Ex-Queen Liliuokalani, her gift of the emblem of Universal Humanity, that you may raise it above your labors in behalf of those your countrymen and their allies, who with devotion to the very limit of suffering and death, offer themselves in this struggle for universal democracy. “Your work of alleviation of suffering has touched the heart of Her Majesty and those in authority from the President of the United STates to those on her own island home and her friends, who now know of her deep personal interest, for it has been manifested in every way within her power. Col. C. P. Iaukea, secretary of the queen, then handed over the big banner to Mrs. Damon, who received it on behalf of her coworkers. “It is a great honor to receive this flag on behalf of the Allied War Relief Auxiliary and the Red Cross workers of Hawaii,” said Mrs. Damon. We wish to thank you, Governor Pinkham, for letting it be displayed on the executive building as a symbol of loyalty and service to the cause of America. When Mrs. Damon had finished the flag was placed on the halyards and she raised it so that the breezes caught and unfolded it in the sunlight. After today it will be taken down and kept in the throne room as a token of Queen Liliuokalani’s generous heartedness. Beginning today the throne room in the capitol building will be kept open on Friday afternoons to give opportunity for service to those women who cannot come for Red Cross work in the mornings. Mrs. Henry F. Damon of the Allied War Relief Auxiliary said today that this is in the nature of an experiment and will be kept up only if the attendance on Friday afternoons warrants it. There have been a number of requests to keep the rooms open during some afternoons, and Friday has accordingly been selected. Dear Sir: It affords me much pleasure in handing you a Red Cross flag, with the request that it be presented to the ladies of the Allied War Relief Auxiliary of the Honolulu, Hawaii, Chapter of the American Red Cross, as an expression of my warm and hearty sympathy with the cause of humanity and an abiding faith in the work of the patriotic women of Hawaii. In presenting this emblem of the Red Cross, may I suggest that it be first displayed over the executive building so that all who may see it may be reminded of their patriotic duty and know that beneath its folds, in the throne room of Iolani palace, sit a group of silent workers giving of their time and untiring effort in the work of alleviation and mercy? Honolulu Star-Bulletin, Volume XXV, Number 7932, Page 3. September 14, 1917.